Most observers expect economic growth to benefit from the new fiscal stimulus programs through at least the next 18 months. 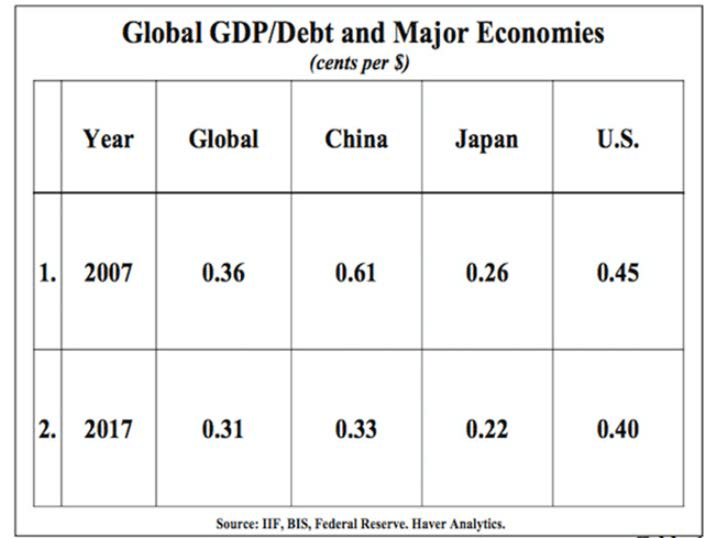 With that in mind, this commentary provides some aspects of changing monetary policies and the ever-growing budget deficit that could affect future economic forecasts and financial market performance as those fiscal benefits decline. Since the middle of last year, our commentaries outlined an aggressive view on the fed funds rate increases. Looking forward, the Fed will likely increase the fed funds rate 3 more times this year and 3-4 times in 2019. When doing so, Fed Chairs use the potential for rising inflation as the main reason. In contrast, we see the need to put financial tools in place to deal with a potential future economic slowdown as the Fed’s unstated reason. In past recessions, the Fed cut the funds rate by as much as 500 basis points. Therefore, its 3% plus 2020 target for the funds rate may still limit the Fed’s impact when applying this traditional tool to deal with an economic slowdown. With our ongoing eight year economic recovery, the Fed now sees less need for its over $4 trillion balance sheet to underwrite the economic expansion. Therefore, as a second step to normalize monetary policy, late last year, the Fed started using quantitative tightening (Q.T.) to reduce the size of its balance sheet. For 2019, this means the Fed will not rollover up to $600 billion of its financial asset investments coming due. By early in the next decade, the Fed’s balance sheet will likely decline to about $3--$3.5 trillion. Despite Q.T., investors still primarily pay attention to the speed at which the Fed will normalize—increase—the Fed funds rate. This singular focus may reflect the absence of any history to judge the impact of Q.T. Next year may bring greater notice as funding rapidly increasing treasury borrowings may face an uncertain bond market if Q.T. begins to bite. Two major fiscal actions, tax reform and bi-partisan budget agreements, raised the FY 2018 deficit by an estimated $240 billion to over $800 billion. The Treasury Advisory Borrowing Committee (T.B.A.C.) estimates Treasury will borrow $955 billion net in FY 2018 compared to $519 billion in FY 2017. T.B.A.C. also estimates Treasury will increase its borrowings to over one trillion dollars in each of the following two fiscal years. With the Fed reducing its balance sheet and treasury increasing its borrowings, an additional $400 billion quarterly must be raised from private and institutional sources in 2019 and 2020. Greater Funding of a Surging Budget Deficit May Surprisingly Shorten the Use of Q.T. According to a recent speech given by Fed Vice Chair Quarles, the Fed originally assumed, because of Q.T., it would not roll over $400-460 billion of its balance sheet assets in each of the next two years. Instead, substantially increased treasury borrowings may enable the Fed to reach its pre-set limit of not rolling over $600 billion annually. By doing so, it will likely shorten the Fed’s use of Q.T. a recent analysis from Goldman Sachs outlined the complex relationships that may shorten Q.T.’s use and lessen the amount the Fed will need to reduce its balance sheet. According to their analysis, it could shorten the Q.T. program by about a year. This would mean Q.T. would end sometime in 2020. At that time, the Fed will likely continue to increase the fed funds rate in order to reach its normalization goal. Increased Federal deficits reduces total net U.S. savings. As a result, the U.S. will be even more dependent on international savers to finance our growing Federal deficit (see Figure 1 below) Much of such international savings comes from earnings on exports to the U.S. this means that the U.S. may need to increase its trade deficit, not reduce it, in order to finance its growing budget deficit. Our 3/2/18 commentary titled “Higher Tariffs and Higher Budget Deficits Do Not Mix,” outlined the issues. 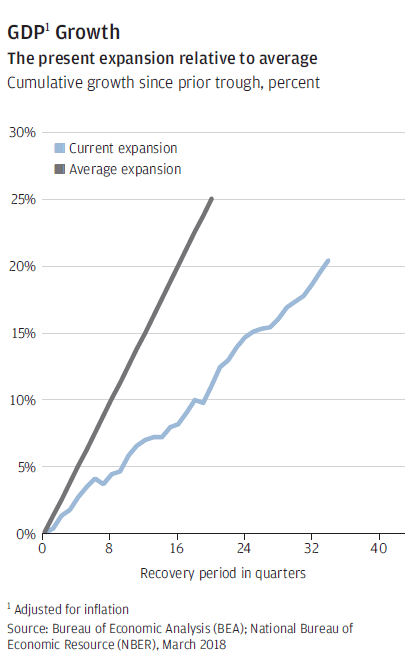 Despite extremely accommodative monetary policies since the great recession, the current expansion grew at about half the average of past expansions (see Figure 4 below). Usually at this stage of an economic expansion the Federal Government will attempt to moderate its deficit. 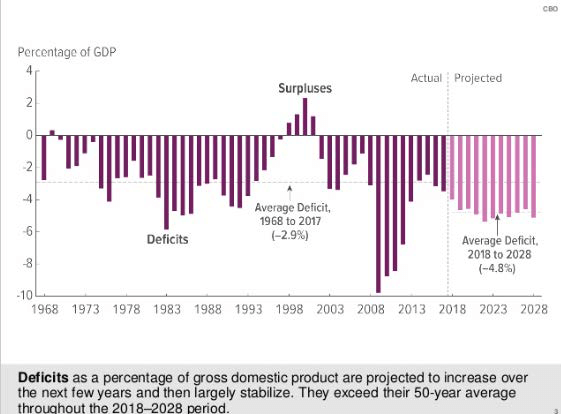 Instead, Congress and the administration added substantial amounts of fiscal stimulus resulting in a rapidly expanding deficit. As the benefits from this fiscal stimulus ebb over the next 18 months, most economists then expect quite moderate rates of economic growth by historical standards to return. 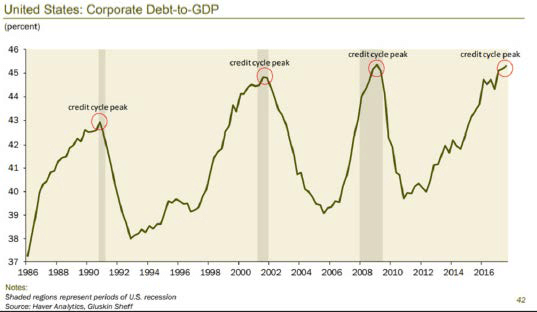 The fact that it takes a “heck of a lot” of monetary and fiscal stimulus just to keep the economy growing at below historic growth rates should concern investors. Even more concerning, how much monetary and fiscal policy stimulus will it take when the economy hits a rough patch? As the fiscal stimulus takes effect, most economists expect growth over the next 18 months to reach higher levels than experienced in the recent past. We used this commentary, however, to illustrate some issues that may arise if the Fed’s normalization policies do take hold as the fiscal stimulus benefits fade. Unlike past relatively moderate shifts in Fed policy, the Fed’s dual reversal of its aggressive use of new accommodative tools—Z.I.R.P and Q.E.—should require close monitoring for their impact. Since Fed policy shifts affect the economy with a lag, this should give investors time to adjust their portfolio asset mix—if needed.